Lyn Risling’s solo exhibition "Reconnecting: A Cultural Journey" opens with a reception, 4:30-6:30 p.m. and artist’s talk at 5 p.m. The show will run through March 10. This exhibition will feature artwork by Lyn Risling, celebrating the publication of her latest illustrated book, Coyote at the Big Time: A California Indian 123 (2018), and also showcasing her earlier book A is For Acorn: A California Indian ABC (2015). 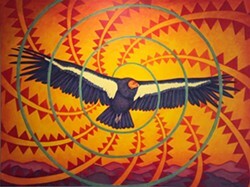 The show combines a large selection of Risling’s captivating paintings, including original artwork from her published books, with copies of her published books, as well as ceremonial regalia and intricately patterned Native American baskets.